Students use Adobe Premiere to edit video in class. Seventh graders have a 52-day cycle of 40-minute classes. Students explore video editing They practice the use of video while collaborating to create short videos and a final Public Service Announcement. Planning, script writing and copyright understanding are emphasized for all video projects. Students will be using Adobe Premiere Elements software in class to create their videos. They will work with music, effects, sounds, text and titles, and a variety of video clips. There is so much available in the world of video editing today. We can all become amateur movie directors! This is a great class for students to learn skills that may help them create presentation materials, create professional looking projects for other academic classes, or even create a sports or music highlight reel that could be used to help them get into high school or college programs! Eighth graders have one 26-day cycle of 40minute classes. Here they use skills learned in the grade 7 class to help them expand their knowledge to the entire video production process. They now have the chance to use cameras and mics, green screens, and lighting to produce their own videos. They learn the proper use of video and audio equipment and gain an understanding of basic video editing. Planning, script writing, and copyright understanding are emphasized for all video projects. A new addition to this year's program is the Young Producers Recognition Program. Students will be encouraged to submit their finest video productions pieces from various categories to a judge panel. There will be nominees in each category from both Martin Kellogg and John Wallace. Those nominees will be invited to a red carpet ceremony at which the short videos will be played and the winner will be announced. With the Internet at your fingertips, you have to be aware of of copyright laws. It is a difficult to understand all areas of copyright, but below you may find some resources and information to help you make sense of it all. Hopefully it will help you make the right decisions, especially when working with the many types of media you experiment with in here! Planning is hands down the most important part of the production process when creating a video. You may choose to storyboard it or script it. A good idea is also to have a list of shots you want when filming and props you might need. Here is a great article on Storyboarding and Planning. This is a great free storyboard creator online (and app). Remember, you must adhere to Copyright Laws which protect original works. Almost all modern music is copyright protected, so in order for you to use it on your website or in your video, you would have to make arrangements with the musician. This is usually not possible. So, the safest kind of music and sound you can use in these projects is "royalty free", "stock" or "buy-out" music. Check out these Royalty Free Sites. Please check out the forms listed here to help you with production and time management for your projects. Want Help Using the Green Screen? Did you know that you can transform yourself, or someone else, into another place? You can do this using the Green Screen Effect. Choose a photo or video background you wish to use behind you first. Think about where you want to place your actors/reporters over that background. Then set up a green screen, be sure your subjects do not wear green and then film with that solid green screen in the background. Click on the file below to help you when editing with the green screen/chroma key effect. Mrs. Baylock's final cycle of 7th graders produced a final video as a class and had a lot of fun with it! The Harlem Shake: check it out! 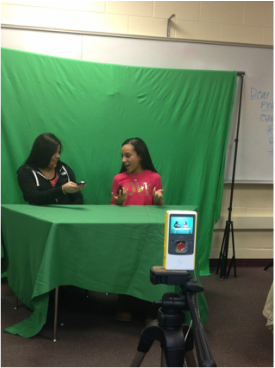 7th graders film a PSA using the green screen and a flip camera. This is an excellent example of a student PSA that was created using the stop motion effect. The student tooks dozens of sequential photographs rearranging the props and actress in each one. Then she edited them together,adjusted the clip lengths, added titles and put it to music...thus creating this seamless production! Nice work! This video was created by two 7th grade students, Mateusz Kaczynski and Michael Golowiejko (Grade 7-2013), to promote John Wallace's Olympic Day schoolwide event. They filmed over an hour's worth of footage and edited it down to under 2 minutes. Check it out! Click to view a well-developed student website! Wow! Check Out this Student Website!! Click to view a fun and informative student website! More Great Web Building From a 7th Grader!